Dinner starts with the Prosperous Rainbow 'Yee Sang' tossing. 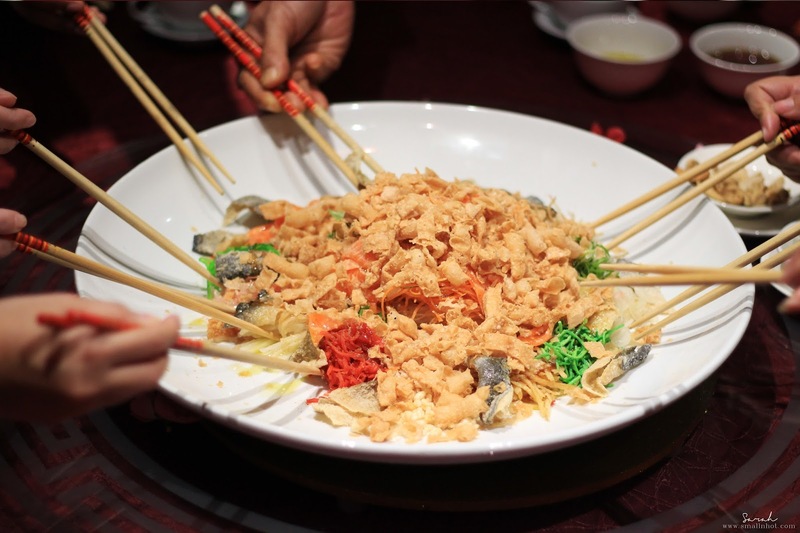 The Yee Sang is served with slices of fresh salmon and fried salmon skin. It was a simple yet flavoursome, especially the crispy salmon skin, it really gives the whole yee sang an extra crunch and sweetness to it. Definitely a must try ! One thing I look forward to when it comes to Chinese menus is the soup because it's warm up me up before starting a meal. And this hearty bowl of goodness comes with slices of mushroom, scallop, oyster, fish maw and everything good. 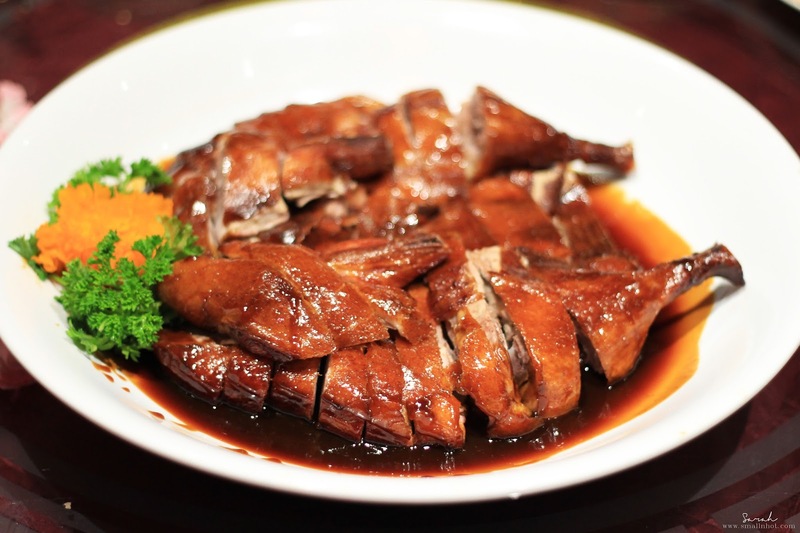 The Pei Pa Duck is vibrantly flavored. Crispy from the outside and still juicy and tender on the inside. I have to say it's was a perfectly roasted Pei Pa Duck. I wish they serve it with some plain mantau to pair with, because it would make a great flavourful dip. Here's one of our favourite dishes from the menu, the Steamed Giant Grouper Fillet. One thing that you might notice is that it was served in fillet form instead of the huge grouper with it's head. The reason for that is to simplify the servings while preserving the freshness and flavour of the fish, ensuring everyone's get a taste of the fish while it's warm. 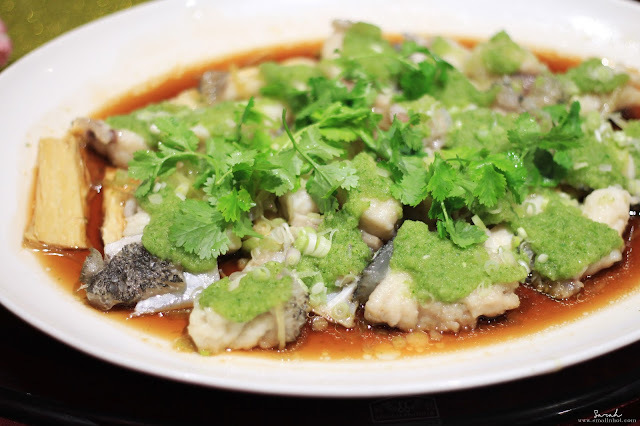 Also the specially blend ginger and parsley dressing for the Grouper was apt with a great balance of spiciness and saltiness. Oh dear, the prawns were big, bold and rich. 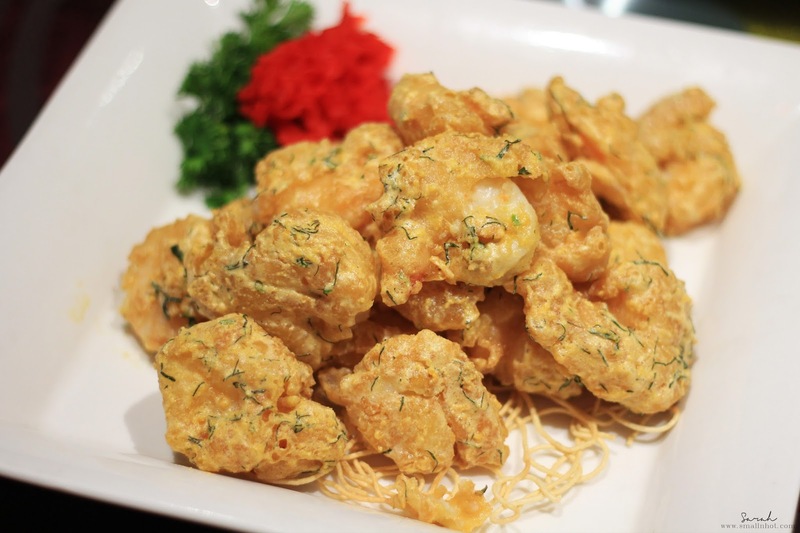 It was beautifully coated with salted egg batter, making it crispy, salty and sweet all together, such a harmonizing plate of flavours. A good plate of very serious food. 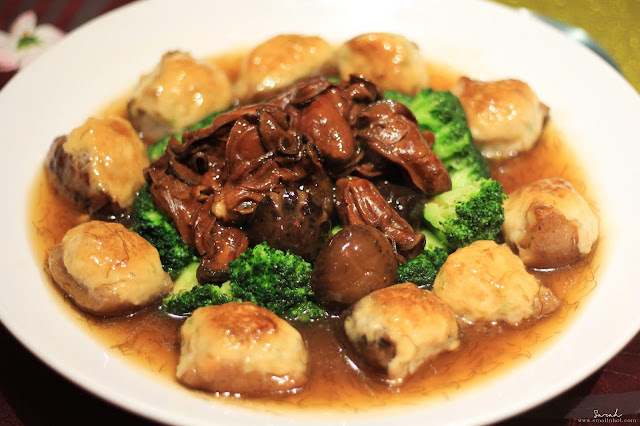 which come to gather in a medley of sea cucumber stuffed with fish paste and stir fried oyster, served alongside with some soft broccoli and sweet sea moss sauce. believe me a must try dish. A simple bowl of glutinous rice with cured wax meat, giving a touch of saltiness to it. 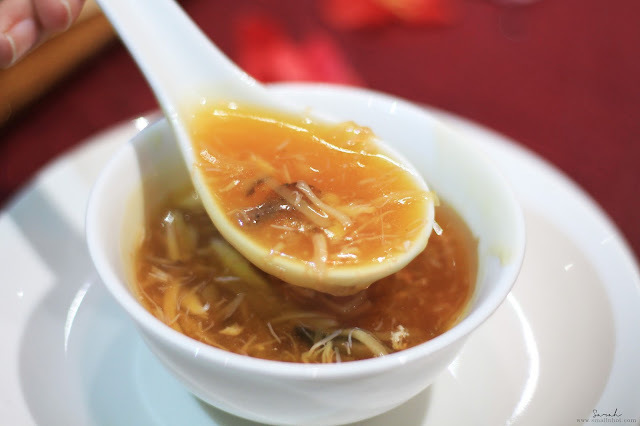 To complete our meal a double-boiled papaya soup with Osmanthus Flower was served. 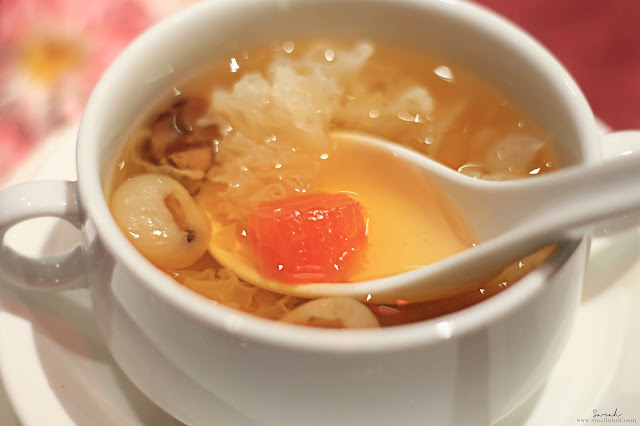 The generous portion of white fungus and longan, all expertly cooked, making it a perfect end to our meal. 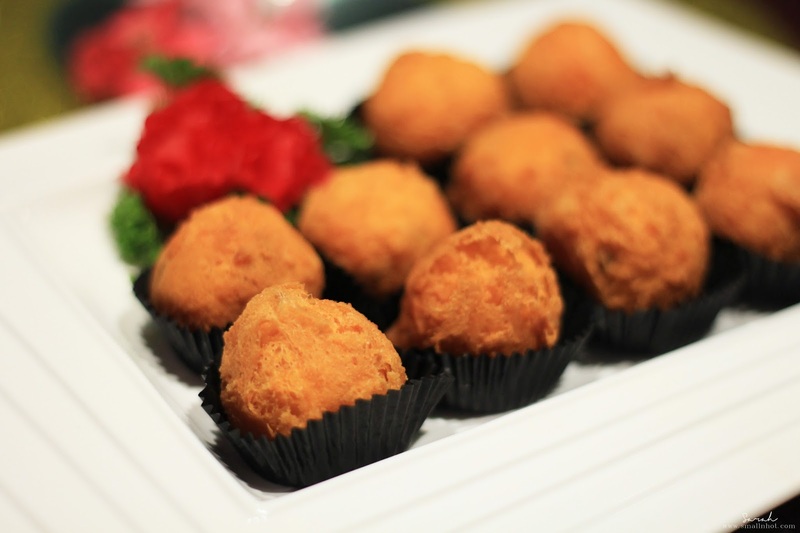 The dessert section also includes a Chinese New Year classic, Batter Fried Nian Gao with Sweet Potato. 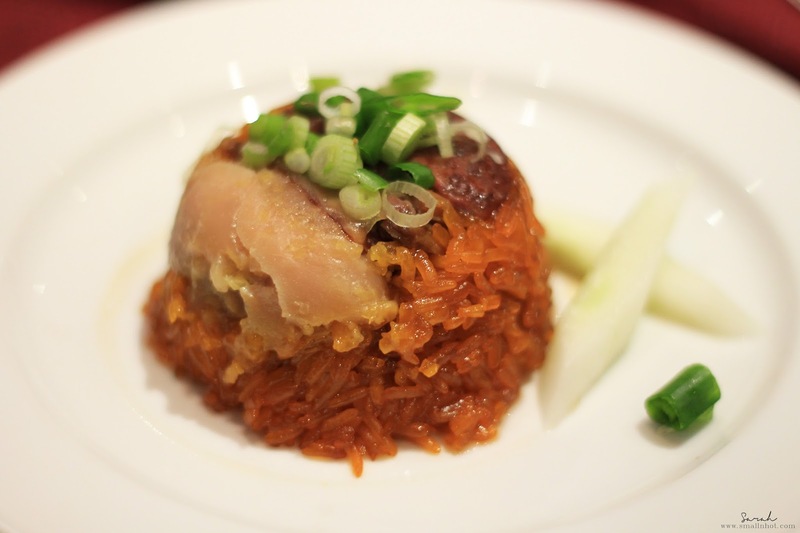 instead of having the Nian Gao sandwiching the sweet potato like a thick layer cake, the chef served it in a chocolate truffle-like kind of ball, which simply gave the dish a new twist. 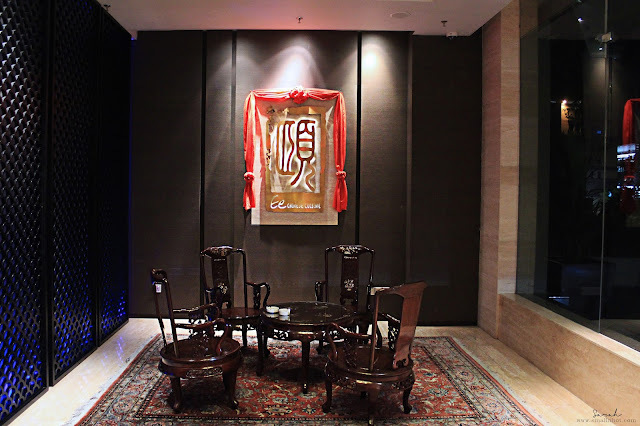 Other than the course meal sets at Ee Chinese Cuisine , there's also a Chinese New Year's Eve Buffet Dinner at Swez Brasserie for those who enjoy mixing and matching, priced at RM 138 nett per adult.